Lock in a great price for Sportresidenz Zillertal - 4 Sterne Superior – rated 9.5 by recent guests! This is my third stay in this hotel. The hotel is located in a very nice golf course, and surrounded by breathtaking views. The staff is super friendly and the rooms are spacious and super clean. Everything was simply perfect. i liked everything it's an excellent hotel!! The building the suite and the facilities are really nice and perfectly maintained. The area is quiet and safe. Infinity pool. Reception staff was great! Bike rental. The staff were so friendly - nothing was too much trouble. There was the perfect balance between privacy and attentiveness. The evening meals were outstanding - the chef is excellent! The rooms are are to a very high standard. The airconditioning is actually silent, the rooms are very spacious and the blinds are very effective if you want to sleep longer in the mornings. The quality of the bathroom is also very good. The fitness suite is very good for a hotel - one of the best I have seen/used. Although I am not a golfer (my husband is), there was lots to do; walking, great jogging track, biking and relaxing at the pool and in the spa. Even though it has an appeal as a golf hotel - you can make more of it. The golf course gives it a wonderful surround which you can appreciate without being a golfer. Good value for money! Everything was fantastic, truly a gem of a hotel. Wish we could have stayed longer! Ein traumhaftes Zimmer mit eigener Sauna und tollem Ausblick! Das Essen war exzellent und das Servicepersonal sehr freundlich. Wir haben jede Minute genossen und kommen gerne wieder! Sportresidenz Zillertal - 4 Sterne Superior This rating is a reflection of how the property compares to the industry standard when it comes to price, facilities and services available. It's based on a self-evaluation by the property. Use this rating to help choose your stay! Offering an outdoor pool and a spa and wellness center, Sportresidenz Zillertal - 4 Stars Superior is located in Uderns, directly at the 18-hole Championship Golf Course Zillertal-Uderns. Free WiFi access is available. All soundproof rooms at Sportresidenz Zillertal feature a seating area with a flat-screen TV and satellite channels. Some units come with a private sauna and a large furnished terrace. Spacious private bathrooms are fitted with a bath tub or shower, a hairdryer and free toiletries. A safety deposit box is provided in each room. 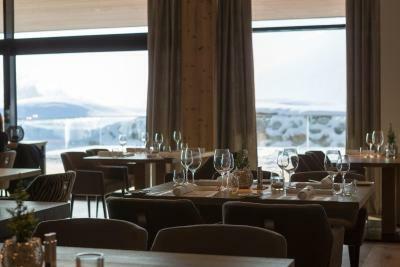 At Sportresidenz Zillertal you will find an à la carte restaurant. Upon request, a special diet menu can be also arranged. Other facilities offered at the property include fitness center, meeting facilities, ski storage and ski pass vendor. Sport activities that can be enjoyed on site or in the surroundings, include skiing and golfing. The property offers free parking. Innsbruck Airport is 24 mi away and guests can benefit from free shuttle service. When would you like to stay at Sportresidenz Zillertal - 4 Sterne Superior? This room features a seating area and a flat-screen TV. A private bathroom is fitted with a shower, hairdryer, bathrobes and free toiletries. This larger room with a terrace and mountain view features a seating area with a flat-screen TV. A private bathroom is fitted with a shower, hairdryer, bathrobes and free toiletries. This suite with a private sauna features a large furnished terrace and a seating area with a sofa. Offering a mountain view, private bathroom is fitted with a shower, hairdryer and free toiletries. This suite is located on the lower ground floor and comes with a private sauna, a terrace and a seating area. The private bathroom is fitted with a shower, hairdryer and free toiletries. House Rules Sportresidenz Zillertal - 4 Sterne Superior takes special requests – add in the next step! Sportresidenz Zillertal - 4 Sterne Superior accepts these cards and reserves the right to temporarily hold an amount prior to arrival. This is our second visit to the hotel. We were impressed the first time whilst this time we felt quality had slightly dropped. Some of the members of the staff were not particularly friendly. We couldn’t understand if the reason was that most of the folks in our group didn’t speak German so communication was not the easiest. They offered us to upgrade to half board. The price is reasonable but the quality of food is not outstanding. Overall the hotel design was too much: too many colors and materials mixed together. Shiny looks do not correspond with the wood and nature. The breakfast buffet was poor. The dinner menu selection was good, but what we got on a plate was again too much: too many tastes on one plate or no taste at all. Having popcorn in a dessert? The above described feedback considers the rating and price of the hotel. You would expect much better food. We were at sister-hotel Gradonna Mountain Resort and write this feedback based on the comparison of those two hotels. If you are not a golf player, it makes less sense going to this particular hotel.